Light frequently activates nature’s chemical reactions, and chemists are increasingly studying its potential to drive artificial chemical reactions too. Industry, however, generally relies on heat for activation energy. Now, US researchers have shown that light and heat can together drive a potentially important reaction for hydrogen storage, allowing it to proceed rapidly under mild conditions. Various reactions carried out over metal catalysts proceed more quickly when the catalyst is illuminated. This is due to the plasmonic interaction, whereby photons excite collective electronic excitations called plasmons in the metal. It has been unclear, however, whether the speedup results directly from high-energy electrons produced when these plasmons decay or whether localised heating of the catalyst is responsible. 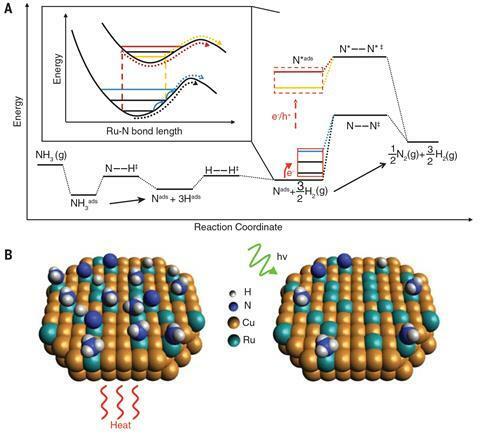 Researchers led by theoretical physicist Peter Nordlander and experimentalist Naomi Halas, both at Rice University in Texas, studied the effect of light on the ruthenium-catalysed dissociation of ammonia. This reaction has industrial potential for storing and releasing hydrogen fuel, as the only byproduct is nitrogen. However, its high activation energy requires high temperatures to proceed at an acceptable rate. The rate-determining step is normally the desorption of nitrogen from the catalyst surface: ‘The activation energy for the dissociation step is very small, so you end up saturating the catalyst surface and nothing gets out,’ explains Nordlander. The researchers produced a hybrid copper–ruthenium nanoparticle catalyst: when they illuminated this at a wavelength of 550nm (the plasmon resonance frequency of the copper), the reaction proceeded up to 177 times faster than when catalysed by ruthenium alone. To determine whether or not heating could explain this, the researchers monitored the temperature of the catalyst surface with an infrared camera. When they reproduced this catalyst heating in the dark, it had no significant effect on the reaction rate. The researchers concluded, therefore, that the dramatic effect was due to high-energy electrons from plasmon decay stimulating nitrogen desorption from the catalyst surface. The researchers are now designing different plasmonic nanostructures to catalyse other reactions. ‘We can tailor the energy of a plasmonic nanostructure to generate electrons of exactly the energy we want for a particular chemical reaction,’ says Nordlander.